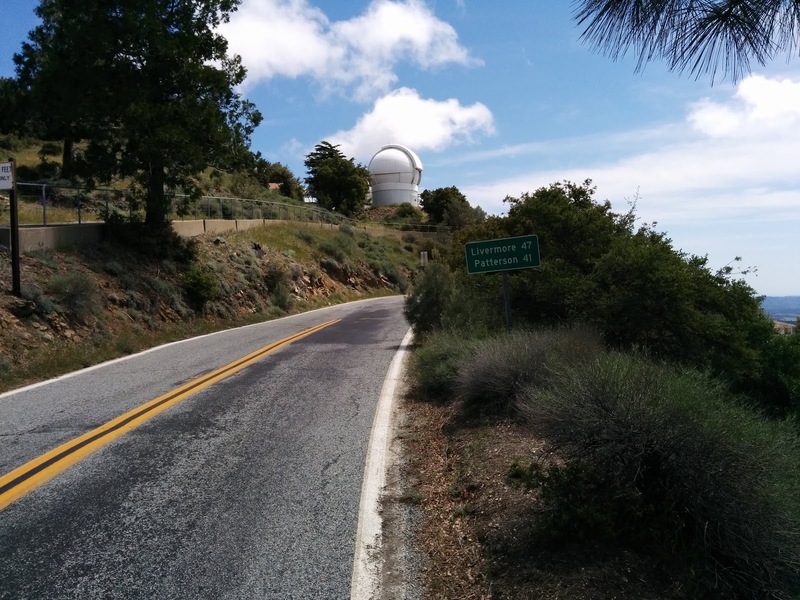 Today I finally did something I've been meaning to do for a long time -- I cycled the Mount Hamilton/Livermore loop. I've done this ride once before, but lately every time I get to the top of Mount Hamilton I find some reason to turn around. This time I got to my Berryessa parking spot at about 8:30, on a day clear and warm but not hot. I managed to climb to the top of Hamilton in good order, and once at the top I felt good, with no excuse to cut the ride short. So after filling my bottles and having a couple welcome cans of juice, I started the descent on the backside of Hamilton. At some point along this descent, I think I broke a front spoke. I mean, I know I broke a spoke; I think it was in this section. I rode through the valleys behind Hamilton in the enjoyable company of a fellow rider. We split up at the Junction when I stopped for a tuna sandwich and he continued on. The road after the junction starts climbing, and at this point the wind started to make itself known, too. The wind would be the dominant feature of the rest of the ride along Mines Road, always managing to be in my face despite the turns in the road. When I got to Livermore I continued toward the center of town, where the Livermore Wine Country Festival had closed down the main streets. Looked pretty popular. I continued toward Pleasanton on Stanley Boulevard, again directly against the wind on this exposed road. I've never been to Pleasanton before, and since I stayed on Stanley as it turned into First and later Sunol Road, I guess I still haven't really seen it. The road appears to pass near, but not through, downtown. 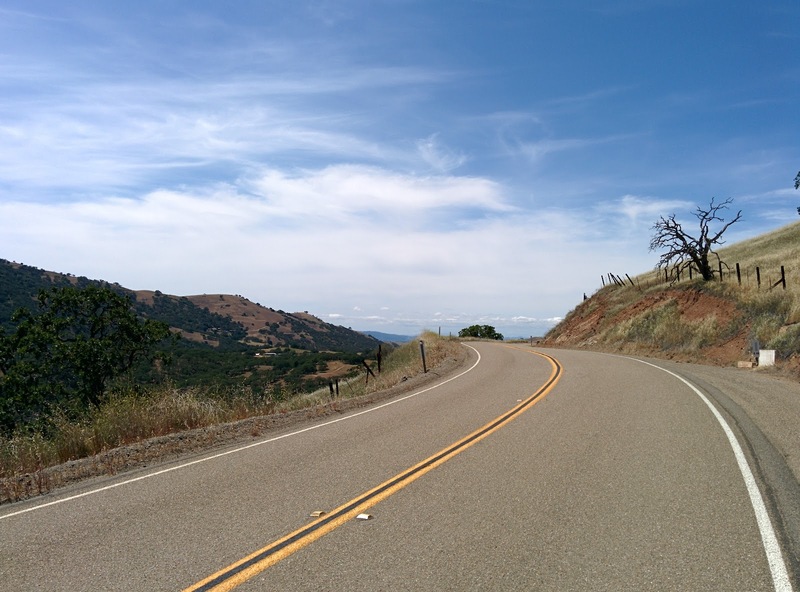 Sunol Road turns out to be a very pretty little road, and since it parallels 680 it appears to be little used. It led from Pleasanton down to Sunol. Is that little store the totality of Sunol, incidentally? 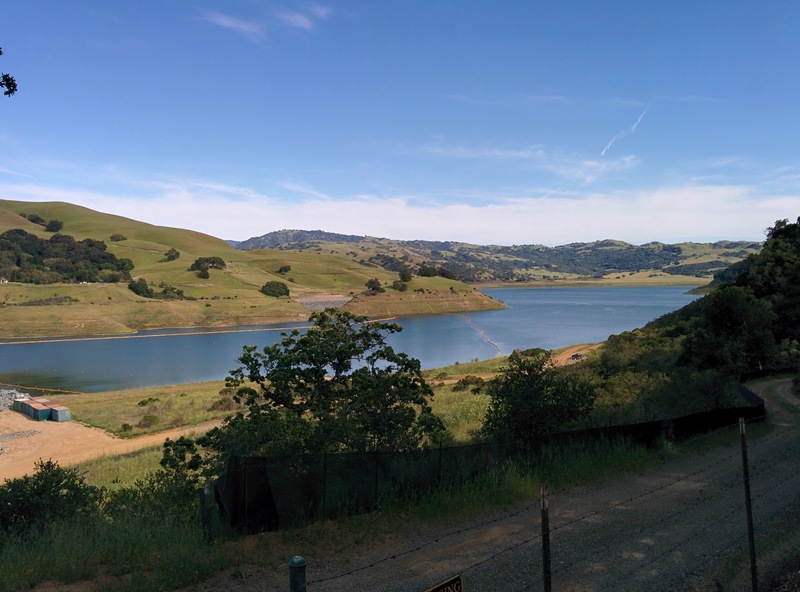 I continued down Calaveras Road, saw the seemingly relatively healthy Calaveras reservoir, and then dropped back down into town, and the end of the ride. Today's little jaunt was a satisfying 103 miles, with 7700 feet of climbing. All the climbs are gentle, so the most difficult kilometer was near the top of Hamilton, at just 6.5%. I'm pretty happy to have finally completed the loop again, but now I'm wondering just how long it's going to take before I can climb the stairs normally.